Doo Wopp out-bursts always a possibility with actor John Goodman - Pop, Rock & Doo Wopp Live! John Goodman recently broke out into song while being interviewed. He was asked about his musical preferences on ABC’s “Popcorn” and while he said he listens to forties music, he was soon singing doo wopp. The song he picked? “So Much in Love” by the Tymes, a 1963 doo wopp classic. However, it wasn’t Goodman’s first stab at the Philly doo wopp ditty. On March 13, 1993, during the “Storm of the Century” blizzard, the star of stage and screen hosted Saturday Night Live with musical guest Mary J. Blige. The majority of the New York metro area hunkered down for the night and a record number of viewers tuned in. Goodman’s monologue began as any other, until he mentioned 4 guys he heard singing in the subway and a seemingly-impromptu doo wopp session broke out. In reality, John had “found” the guys in a world-famous New York hotel. 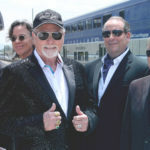 They were an acappella group called the Bravados, led by a friend of the actor’s for over 20 years, Pat Profito. Pat Profito’s career began in the fifties with his own groups , the Love-Larks and the Dynamics. While neither group had any chart success, Pat did some studio work with Al Martino (“Only the Broken-Hearted”) and Connie Francis. After short stints with the Five Discs and a few more groups of his own, he abandoned music to try his hand at acting. 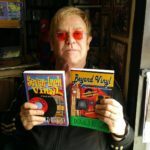 Profito appeared on the cable television comedy show “Waste Meat News” and started the “Improvisational Comedy Workshop Ensemble.” It was there that he began a life-long friendship with John Goodman, as well as a bevy of future show-biz luminaries. Goodman invited Pat to a Christmas party at the Carlyle Hotel in December of 1992. Pat brought his newly-formed group the Bravados along and they quickly became the center of attention. As the boys sang their hearts out, the movie star joined in. It was then that he invited them to join him for an upcoming SNL appearance. 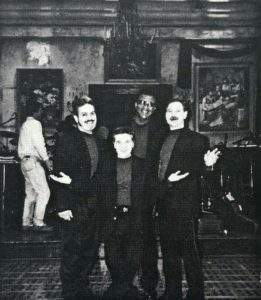 So, on March 13, 1993, with an estimated 30 million people tuned in, Pat Profito, Jose “Papo” Moro, Bernard “BJ” Jones and Warren Tesoro surrounded the host for acappella gold. Profito’s old friend led them through “So Much in Love” to a rousing studio audience ovation. Roseanne’s TV hubby also famously closed his movie “King Ralph”, sing Gene Chandler’s iconic “Duke of Earl.” While some reports were that it wasn’t actually Goodman doing the vocals, the soundtrack credits him as the performer on the track.